Wynken de Worde’s printer’s device. Under the blog name “Wynken de Worde,” Sarah Werner writes about books, early modern culture, and those of us who may be postmodern readers — when she is not preparing the syllabus for her course at the Folger Shakespeare Library. Wynken (not related to Blynken or Nod) was the primary assistant to William Caxton the first printer of English-language books — Malory’s Morte d’Arthur, Chaucer’s Canterbury Tales, and The Golden Legend. Lerner’s newsbook ready for folding. Above is a numbered example of the same newsbook that I used as an image in my last post. The red numbers are page numbers: folded in the right way, you’d get an 8-page booklet in the order indicated. But if you look closely, you’ll see that the actual news sheet doesn’t have page numbers. Instead, there are signatures: at the bottom of the first page is a tiny, blotted “L”; at the bottom of the 5th page is a tiny “L3″ (the “L2″ has been cut off at some point when the page was trimmed). These are signature marks that count off by leaves. What’s a leaf, you ask? It’s a physical unit of paper: when you turn the page in a book, you are actually turning a leaf of paper. Early modern printers would have thought in terms of sheets and leaves, not pages, when they were figuring out how to print a work. Depending on the imposition (how the text is laid out on the sheet), you could end up with different numbers of leaves: 1, 2, 4, 8, 12, 16, 24. 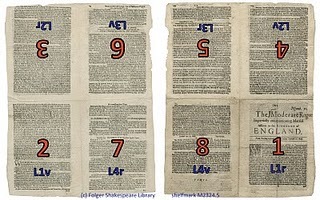 A quarto imposition results in a sheet of paper being turned into 4 leaves; there are 2 pages to each leaf (a recto side and a verso side), so there are 8 pages in all. The blue letters and numbers show the signatures. One thing that throws off beginners is understanding how recto and verso relate to each other. They do not mean right and left but front and back. Ah, the books arts. Imposition. The dying arts? You need look no further than the end of your Proboscis to see that that is not true. Proboscis is a London-based non-profit studio that commissions and facilitates new works and publications, some of which can be found in the DIFFUSION library. And just a bit further along the continuum is Francisca Prieto, also in London. Inspired by the serio-comical poet Nicanor Parra’s “antipoems,” Prieto offers up The ANTIBOOK. 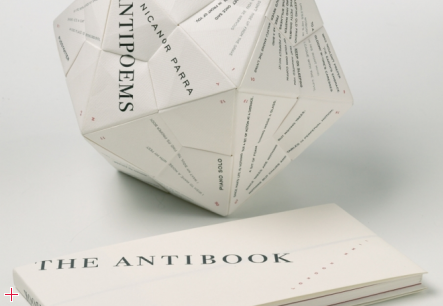 The reader must fold the pages of the book (20.5 x 10.5cm) to form the icosahedron (15 x 17 x 19cm) in order to read Parra’s antipoems in order. Whether Prieto’s ANTIBOOK or the DIFFUSION ebooks are book, art, both or neither, they and Wynken de Worde make us think with our hands as well as our minds about what can be done with the form and concept of the book. And that makes the concept of imposition worth a bookmark. PS: “Books On Books” acknowledges David Pearson‘s Books as History (New Castle, DE: Oak Knoll, 2008 and 2011), p. 75, for the inspiration of the wording of the conclusion here. PPS: Another opportunity to learn by doing can be found at the end of a short and witty book called A Dodo at Oxford: An Unreliable Account of a Student and His Pet Dodo. Under the guise of explaining, presenting and annotating a diary found in a charity shop, Philip Atkins and Michael Johnson deliver a history of the book. Appendix 7 provides the offer to engage in imposition. Next Article Ads In Books: 1884? Try 960-1279, Sung China! I can’t help it – imagining a class of students folding their syllabus in order to read it is genius!! !